Yesterday, FSC organised a side-event at the Ninth Conference of Parties to the Convention on Biodiversity in Bonn. 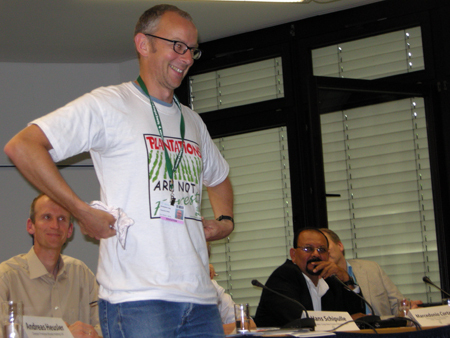 Activists from Global Forests Coalition and World Rainforest Movement made their voices heard at the side event. FSC’s panel responded to a series of questions from the moderator, Stefan Salvador, FSC’s Chain of Custody Programme Manager. Hans Schipulle, Chairman of the Congo Basin Forestry Partnership, told us that modern methods of forest management are carbon neutral or even carbon negative, although he provided no evidence to back up this statement. He agreed with Global Witness’ recent report which described the situation in the Congo Basin as a disaster. But he said that Global Witness’ recommendation to stop logging in the Congo Basin is a “nice position, but completely unfeasible politically”. He argued that FSC is an instrument, which can be used to force forest managers to comply to standards. He didn’t mention that FSC is a voluntary mechanism and can do nothing if companies decide not to get certified. Marcedonio Cortave, Director of the ACOFOP Association of Forest Communities of Peten, told us how wonderful certification in Guatemala is. And Andreas Heusler, of Precious Woods, did the same for his company’s operations in Brazil. No surprises there, then. Most companies tell us that what they are doing is wonderful. CBD was swarming with companies doing precisely that. Christoph Thies of Greenpeace International explained that FSC is part of a long-term vision. According to this vision, we need to step up the area of protected forests in the world. At least half of the forests in the world should be protected, including community managed forests and completely protected areas. Regulation of forestry activities are crucial – one day, when forests are properly regulated, FSC may no longer be necessary. Thies pointed out that in countries without adequate forest laws, FSC cannot work. This is the situation in the Democratic Republic of Congo, for example, he added. Thies said he agreed with the message on the T-shirt I was wearing: “Plantations are not Forests”. However, he said, for any product that cannot or should not be banned (inlcuding palm oil, soya and timber), we need a mechanism to determine which products are better. He did not point out that FSC has certified some of the worst industrial tree plantations in the world. Of course FSC’s problems are not limited to certification of plantations. Thies could have mentioned a Greenpeace report about problematic certifications. Greenpeace has been working on it for several years, but the report has never been made public. After listening to 45 minutes of polite chat from the panel about how lovely FSC is, activists held up a banner reading “FSC: Stop Certifying Monoculture Tree Plantations”. They also read out parts of the statement below and distributed copies to the audience. During the short discussion that followed, Stefan Salvador described how FSC attempts to monitor the certifying bodies and said, “We will never be in the position where the certifying bodies are perfect.” FSC-watch has pointed out many problems particularly relating to FSC’s failure to control the certifying bodies. FSC appears reluctant to even acknowledge that this is a problem. After a few questions and a short discussion, the moderator, FSC’s Stefan Salvador, closed the meeting, although several more people wanted to ask questions. 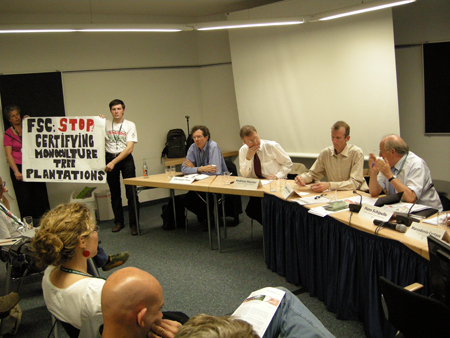 After the meeting Christoph Thies said he would welcome a broad discussion about the issues raised during the meeting. FSC, it seems, is keen to avoid any such discussion. The above statement is posted in FSC’s special section on its web site titled “FSC at the UN Conference of Biodiversity.” What the statement does not say is that the 100 million hectare figure hides millions of hectares of monoculture tree plantations that have been falsely certified as ‘forests’. At the same time, it hides the fact that social and environmental movements from around the world have been for years denouncing tree plantations and demanding FSC to stop certifying them, because among many reasons they destroy biodiversity. This demonstrates that FSC is misleading the CBD with its statement. Be they plantations of eucalyptus, pine, acacia or oil palm, these large scale monocultures are mostly aimed at feeding northern consumers with growing volumes of raw materials extracted in southern countries at a huge social and environmental cost. Local communities are displaced to give way to endless rows of identical trees that displace other life forms in the area. These plantations not only destroy biodiversity but they also deplete and pollute water resources while soils become degraded. Human rights violations are rife, ranging from the loss of livelihoods and displacement, to repression and even cases of torture and death. Apart from having to confront governments and corporations, local communities struggling against large-scale monoculture tree plantations must face the additional problem posed by the fact that these same plantations are being given credibility through certification by the FSC. In fact, most core elements of the Convention on Biodiversity have been effectively violated in those millions of hectares of certified plantations around the globe. Certification of plantations by FSC is symptomatic of the dominance of corporate interests in FSC. The credibility of FSC is increasingly undermined by certification of these and other destructive projects. Nowadays FSC’s decision-making is controlled by corporate interests which try to convince consumers that buying more timber products is good for biodiversity. This is undermining the efforts of environmental organizations, which are working on educating consumers on the need to reduce consumption. Plantations are not forests and FSC should not certify them! FSC should STOP being a tool for corporate interests!